The MHS Board meets the third Thursday of the month at 5:00 p.m.. Pratt Hall in the summer, Public Safety Building Conference Room in the Winter. 1. The Legislative Directory contains information on legislative rules, members, and other governmental entities. About how many rules did the Senate and House each have in 1880? 2. How many members did the House of Representatives have? 3. 135 representatives listed their occupation as Farmer. How many listed Teacher as their occupation. 4. How many were born in a foreign country? Chairman's Message: Proud members of the "benign fringe element..."
Typically operating on a shoestring budget and stewarded by elders, local historical societies — especially the teensy ones — represent a sort of benign fringe element throughout the state. Their members meet on third Mondays or fourth Thursdays, but not always; many close down in winter or convene when members are able. Historical societies might be headquartered in former schoolhouses or freight stations; at least one is above a police station. Others have no formal location at all. Like the hyper-local histories they strive to document and archive, town historical societies often lead a precarious existence, dallying with obscurity in both content and form. Though their patchwork archives may read like non sequiturs, and the rewards of collecting may look slim to outsiders, what's at stake is the very identity and continuity of these communities. Eileen Corcoran is community outreach coordinator at the Vermont Historical Society; it's her job to act as liaison between the state and local organizations. She's known some societies to officially disband, Corcoran has known other historical societies to exist in name only. Historical societies can also be resurrected: Ripton's relaunched in 2013, as did Hancock's in 2016. Corcoran described the smaller groups as "great community-based organizations that are doing the work for VHS in a lot of ways." Of Vermont's nearly 200 groups, 60 to 70 percent have some sort of physical location, she estimated. Volunteers, often senior citizens, run most of them. "The general demographic of historical societies tends to be an older generation," Corcoran acknowledged. "It's always sort of been that way." Managing or even participating in a historical society requires "spare time," she added, and that's something young professionals or parents of small children tend to lack. Corcoran speculated that the impetus for historical society work comes from "starting to see that kids growing up now don't know or recognize the stuff you grew up with, and wanting to preserve and share some of those [things]." Vermont, she noted, is an "old state," referring to its aging population. It's rare to see a new historical society form in Vermont, Corcoran added, partly because the state is already saturated with them and partly because the traditional models are "not speaking to newer generations." Nationally, many such groups were established in the mid-1970s and '80s, she said, spurred by the 1976 U.S. Bicentennial and countering the trend of widespread urban renewal. — Rachel Elizabeth Jones Full article here. This year's commemoration will be at the Hill West Cemetery (on West Hill). It will be Sunday morning at 11:00, May 27th. The brief ceremony will feature remarks, roll call of veterans interred in the cemetery, honors by American Legion Post 42, and refreshments. Please join us to pay our respects to those who gave their lives serving our country and all those veterans interred in Town. The deadline for applications for the MHS annual scholarship grants is May 1st. Applications were mailed to all eligible Montgomery high school seniors in February. It's also available on our web site. Scholarship Application. The scholarships are the legacy of Lalia Pratt Hays, Amy Booth-Meyers, and Joe and Irene Scott. Winners will be announced at our Annual Meeting in June. The Board isn't planning any major projects on Pratt Hall but the clock is giving us problems again. We will be trouble shooting it once it warms up. We also plan to continue working on the grounds of our storage building and will start design work once the snow melts. Since 2008 the Society has been submitting historical articles for the Town's Annual Reports used for Town Meeting. They are meant to provide an educational and entertaining look at Montgomery's past, and promote greater awareness of, and involvement in, the Society. Some of these articles are abridged versions of our exhibits or other work, some are unique to the Reports. This year's was a look back 225, 110, 50 and 10 years ago. We've added all of these articles to our web site and they can be reached by clicking the linked title above. The St. Albans Museum is hoping to put together an exhibition on Farming in Franklin County and has reached out to county Historical Societies. While we have little in terms of artifacts to contribute, we offered to facilitate where possible. They hope to have it installed in their museum for this summer. This got us thinking about a possible companion exhibit focusing on the history of Montgomery farming. We thought it might be a compliment to the Farmer's market and hope to have something by the end of June. Let us know if you have any ideas, artifacts to donate or loan, or want to be involved. Jack and his wife Penny joined the Society in 1985. In 1987 he became President and then in 1989 Treasurer until 1994. His treasurer’s report was always very detailed as he was an accountant by profession. He and Penny were great supporters of the MHS, always willing to help out. Even after Penny passed away he kept in touch with his friends in Montgomery. We could always depend on Jack to renew his membership and he was one of the first ones to contribute to the West Wall Capital Campaign. We will miss him. We send our thanks and prayers to his family. 2. How many members did the House of Representatives have? B. 238. Each Town had one representative. Three towns were not represented. Since 1965 there are 150 in the House each represents about 4,000 people. 4. How many were born in a foreign country? C. 10. From 4 countries, Scotland, Ireland, England, and Canada. The Vermont Historical Society has been putting more and more resources on its web site. Included among them now are it's flagship publication, the Vermont History Journal. Access to current year issues requires a member log in but 2017 and earlier are available to everyone. Check them out. Our latest order of six more engraved walkway bricks was just sent in and will be installed in the walkway as soon as possible. If you would like to order one please contact Pat Farmer. You can also order on line at our History for Sale link. This year's MHS Annual Meeting will again be part business and part celebration. It will start with a short meeting at 6:00 at Pratt Hall and once we wrap up we will move across the street for a sit down dinner at the historic Black Lantern Inn. Invitations will be mailed out to all members in May. There is room for 50. Paid reservations are needed by June 15th for planning purposes and can be given to any Board member, mailed in, or made in person at Lutz's with Elsie or Andrea. We are also looking for member volunteers to set up, take down, and/or man the Society booth during the day. If you have a morning(s) you could lend a hand please call Sue or email us at pratthall@gmail.com. Pratt Hall will host a VT Humanities program on Vermont native Charles Ross Taggart, the Old Time Fiddler on May 6th at 2:00 p.m. Taggart appeared in some of the first sound motion pictures, even before Al Jolson. Adam Boyce's portrayal of Taggart includes stories, fiddling, and more. The Society is co-sponsoring this with the Montgomery Friends of the Library. Pratt Hall will also be the venue for a concert by the Zookeepers on August 18th to benefit the Montgomery Library. Doors open at 7:00 p.m. Music at 7:30. Save the date 2019: The Northern Bronze hand bell ringers will perform May 11th, 2019. Do you have any ideas on programs you'd like to see? Please contact us and let us know. Get the latest info by clicking the Event link on our home page. April: 1865 Morris Braman is the last Montgomerian to die in the Civil War. May: 1887 First Town Memorial Day parade organized by local chapter of the Grand Army of the Republic. June: 1983 Six year old boy gets lost in Black Falls. Walks out to Route 242 the next day, uninjured. Since the last newsletter we've received additional family information from Frances Hopkins, including copies of photos of several of her relatives. 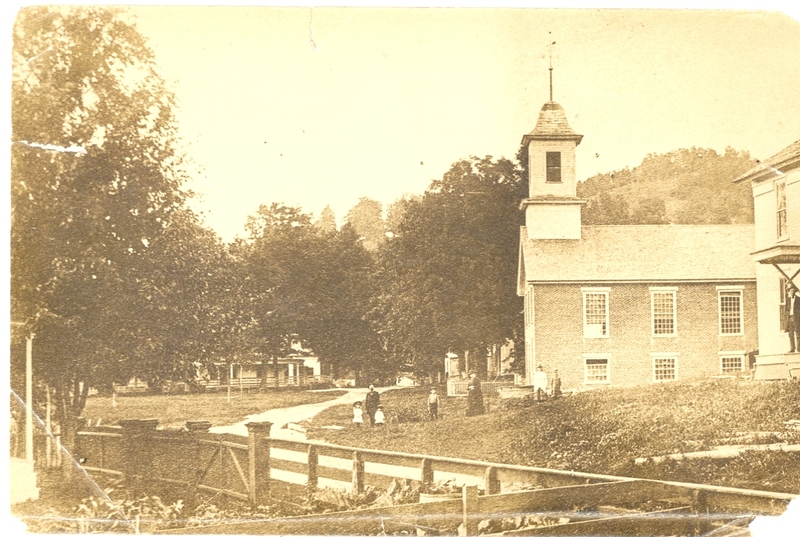 Theresa Begnoche donated some ephemera of Dulah Purrier, and Ann Wheelock donated an annotated early photo of the Methodist church (below). Also our friends at the Swanton Historical Society donated photos from the 97 flood and we picked up photos of the PSB Open House from the Town Library. Our thanks to all of them. If you have anything you would like to donate just shoot us an email. 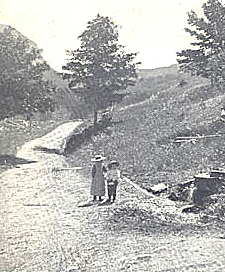 People identified in this photo include: Rev J. P. Bragg on parsonage steps far right, Henry Martin and wife and daughters center, near road, Ed and Irene Pratt. Collar Hill (behind church) and Salva Goodspeed's house in background. Jo Anne Bennett, Tim Chapin, Patty Perl, John Beaty, Mark Baddorf, Bob Cummins, & Andre Labier.